You've found the “U.S. 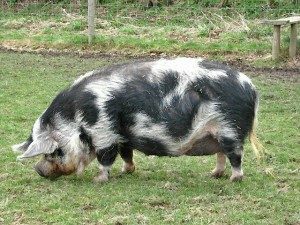 Kune Kune Pig Breeders” page here at Hobby Farm Wisdom! If this is the first time you have visited our site: Welcome! Kunekune pigs are a small breed of domestic pigs native to New Zealand. The native Maori tribe of New Zealand gave them the name kunekune, meaning “fat and round.” These pigs have a unique appearance with a hairy and plump body and wattles below their lower jaw. The hair on a kunekune can be long or short, curly or straight and comes in a variety of colors, including black, brown, ginger, cream, gold and spotted. It has a short black snout and prickled ears. Kunekunes are one of the tallest breeds of domestic pigs, standing an average of 24 inches tall. Their intelligence and friendly disposition have made them a popular pet. While was considered extremely rare and in risk of extinction, that is no longer the case today after strong breeding recovery programs were put in place.